Amid bleak warnings that climate change has already taken a toll on crop yields, depleted fish catches and triggered deadly floods and heat waves, a sweeping U.N. report today offers a glimmer of hope that nations will take the necessary steps to protect people in a warming world. From the building of aerodynamic houses to avoid cyclone damage in the Solomon Islands to switching to drought-resistant cassava crops in Zambia, countries already are embracing methods to cope with the onslaught of weather-related disasters. Boosting resilience, the Intergovernmental Panel on Climate Change (IPCC) report says, will be key to managing climate risks. "The report has a lot of bad news in it. But it also shows that societies and governments are beginning to take steps to tackle adaptation," said Chris Field, co-chairman of the IPCC working group that wrote the report, unveiled this morning in Yokohama, Japan. Field praised what he described as a "flowering of investment" in strategies to manage and alleviate the toll of climate change. "The idea that there is a solution space is really important," he said. "If climate change is totally unmanageable, what are we going to do?" 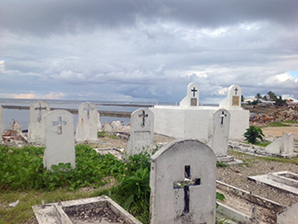 Flooding and rising sea levels have swept gravestones out to sea from this coastal resting place in Marshall Islands. For the first time, the Intergovernmental Panel on Climate Change is studying what options people in small island nations and elsewhere have when they face the limitations of adapting to climate change. Photo by Lisa Friedman. The sweeping report from the Nobel Prize-winning science body is the most comprehensive compilation of research yet into the impacts climate change will have -- and is having now -- on oceans and ecosystems as well as cultures and traditional ways of life. Warning that climate change is being felt "on all continents and across the oceans," the report outlines a frightening world of disintegrating Arctic ice, deadly Australian heat waves and worrisome reductions in wheat and corn crops. "Nobody on this planet is going to be untouched by the impacts of climate change," IPCC Chairman Rajendra Pachauri said. And yet, he and others noted, it's the very poorest who will suffer most. The report puts enormous emphasis on adaptation as a way to decrease the risks to communities as governments dither over reducing the heat-trapping gases from power plants, tailpipes, felled trees and other sources that cause climate change. And despite the praise for new investments in adaptation, the report notes that awareness still outpaces action among governments. The report also explores the idea that making do has its limits. At some point, that is, as emissions continue to rise, species may become extinct or people might have to leave their homes. That assumption underpins a movement within the U.N. climate negotiations to develop a mechanism -- and ultimately raise more money -- to help vulnerable countries with "loss and damage" when adaptation fails. But defining those limits, said lead coordinating author and Stockholm Environment Institute senior fellow Richard Klein, proved challenging. "At what point does [the impact of climate change] become intolerable? That's a value judgement," Klein said. "The policy relevance is enormous because in the debate under the UNFCCC, the whole notion of loss and damage arises because there are limits of the ability of people to respond." Pachauri said he expects the IPCC report to spark many more adaptation measures around the world, calling that part of his reason for "guarded or cautious optimism."